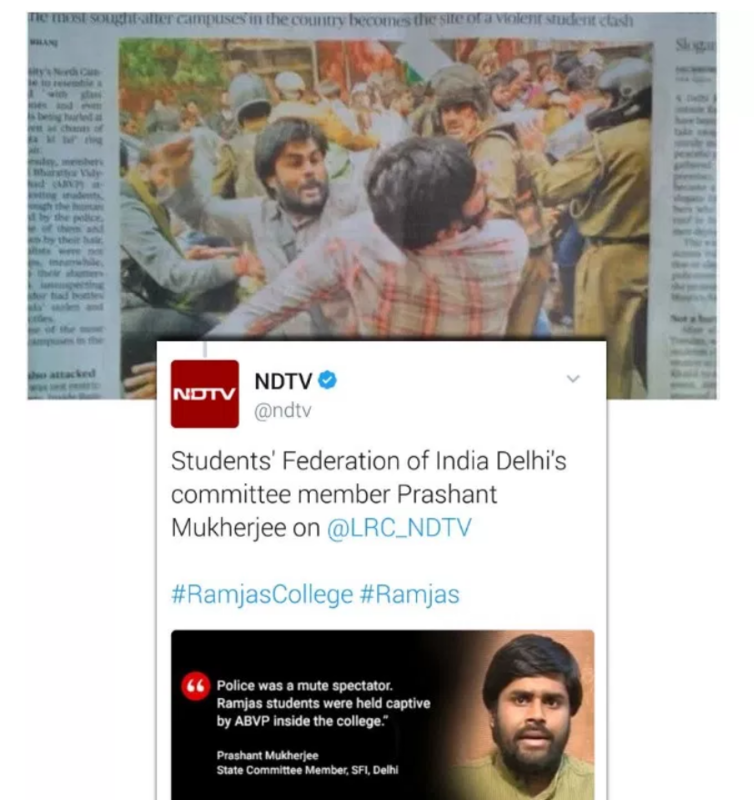 The recent happenings at Delhi University, which began with protests at the Ramjas College and then turned into clashes between left-led student organizations like AISA (student wing of Communist Party of India (Marxist–Leninist)) / JNUSU (JNU Student’s Union) and ABVP (Akhil Bhartiya Vidyarthi Parishad) / DUSU (Delhi University Students Union) on 21st and 22nd Februray 2017, have been widely covered by mainstream media. While many media houses reported that ABVP initiated violence, there have been conflicting reports from the ground. In this media hysteria, the fact that has totally been forgotten is that the problem began with anti-national slogans that were raised when the invitation to sedition-accused Umar Khalid by some students and teachers of Ramjas college was cancelled by the Ramjas administration. Q.) Thank you for taking out the time to speak to Hindupost. You yourself are a student of North Campus and you are an active participant in the activities of ABVP. You were also present on ground through out these recent events in Ramjas. So first of all, please tell us how did so much of agitation begin? Diksha – I’ll tell you the entire episode in brief..
On 21st Feb, there was a seminar organized by the Literary Society of Ramjas College. When the college students’ body and common Ramjas students got to know that Umar is invited, they all went to the Principal and raised objection that invitation to him may spoil the atmosphere of the college. College administration / Principal cancelled the invitation to Umar Khalid. Rest of the event was allowed to continue with other speakers. On 21st Feb, some people from AISA & Literary society started protesting outside the seminar hall in Ramjas. It was noticed that some people from outside Delhi University started raising provocative slogans like ‘Kashmir maange azadi’, ‘Bastar maange azadi’ (Kashmir and Bastar demand freedom) and more. It was then that the general students of Ramjas approached DUSU (currently led by ABVP) for help, and ABVP also joined in. It was alleged by the leftists that ABVP students locked the people in the hall, but it was the Police trying to protect and cover the area. Then on 22nd, they were even blaming the police for alleged bias in favor of ABVP. Police was not biased at all, it is unfortunate that the leftists were protesting against men & women in uniform who were just doing their job. The day on 21st ended with protest on both sides. On 22nd, they had their own march and we had our own. They blamed ABVP for initiating violence but that’s not the truth. We are not crazy to initiate violence. We just retaliated. Q.) So what really happened? How did it all start? On 22nd Feb, both the protests started outside Ramjas college. When they say ‘DU fights back’, why do they need to call so many people from JNU? Are they so weak inside DU? People like Shehla Rashid were there from JNU. Very clearly, their basic aim is to make Delhi University another campus like JNU. These leftists talk about ‘Feminism’ so often, they talk about empowering women. But they allowed their boys/ men to attack girl students who were part of the ABVP march, to abuse, molest and even spit on them. They had come with iron rods to protest! They initiated abusing, hitting and raising anti national slogans, it is obvious we would retaliate. It is very sad that media is so biased , there’s a picture that was published by The Hindu in which the SFI (student wing of Communist Party of India – Marxist) state president Prashant Mukherji is beating a student of Ramjas college, and the caption says ‘ABVP goons attacking’… I mean, look at the irony! Also, if you check Umar Khalid’s social media accounts, these people started spreading rumours that Sec 144 has been imposed in DU by the police. This was further peddled by mainstream media like NDTV, Times of India etc, but we personally checked with the DCP, there was no imposition of Section 144 in DU. So they were just trying to create chaos and panic among the students. Q.) – So how did the day end? Were you also hurt? Talking about myself, there was a picture of me which went viral on social media in which I am trying to hit a boy. I am not denying that I was doing that, but I did it in my self defense. He hit me, he was trying to touch me, I can’t wait for somebody to make a video while I am getting molested; I will obviously retaliate to protect myself. It is sad that their entire definition of feminism changed overnight for their political motives, and they went ahead to shame a girl who was just defending herself. These people were ready with iron rods and cameras everywhere. They were already prepared for this to happen! They recorded everything that went in their favor and media has played along with their game. They were spitting on us, they were hitting us, but they didn’t record that part obviously. Then we all went to Maurice Nagar police station, they were still shouting their own slogans. We dispersed as we had to go for our first-aid and all, after that police handled the situation. Because of all this, the fact that they raised anti-national slogans has been over-shadowed. Videos of them shouting anti-national slogans should have gone viral and media houses should have reported those. Q.) You must be talking to other students about these issues. What do you think is the general opinion/mood regarding the mainstream media? Most in JNU read The Hindu; initially they also believed that ABVP was violent. But when they saw SFI President Prashant Mukherji’s pic beating a student, they were shocked and started supporting us. We make efforts to make people aware. We know the history of JNU. These people are very smart in spreading rumours, manipulating and playing victim card. Q.) Today, i.e. on 27th Feb also, there was a flag march, right? What was it about? Yes, it was organized by DUSU. Participants were mainly students of Ramjas college. It was about promoting the nationalistic sentiment, raising the spirit of nationalism. We are trying to make other students aware, whenever the other side is exposed, we do get a lot of support. They are coming to know the other side of the story. Q.) Do you know that recently some of the leftist and communist students had totally blocked the administration wing of JNU for many days, even threatening professors against entering the block at one point. The High Court had to tell the JNU lawyer to approach the law/court? There was no media hysteria on that….what explains these double standards? Yes, exactly. I don’t understand why mainstream media supports the leftists. Don’t know what is their motive. It is sad that the media is like this, they need to be far more responsible. One more thing is, now these leftists are saying that Ramjas / ABVP didn’t allow Umar Khalid to speak, but then why didn’t they allow Baba Ramdev in JNU? Why did they show disrespect to Sh. Abdul Kalam? Umar Khalid openly says its his ‘freedom of speech’ to glorify a terrorist as a martyr. He calls Afzal Guru a martyr. Q.) Don’t you think that the student politics and protests have gone too far ahead / overboard? Don’t you think they need regulation? Talking like a normal student not belonging to any organization, yes, politics among students has gone too far ahead. But talking on behalf of ABVP, we always promote various cultural activities, seminars and productive activities. What could be more overboard than shouting anti-national slogans in DU? I strongly believe, with conviction, that such activities should not be held. Another point is, there were many professionals supporting the so called cause of these leftist students. It looks like that they just want to come into limelight, and their cause has nothing to do with student issues. Whenever such anti-national activities will take place, we/ ABVP will take a stand. We will not tolerate such anti-nationals activities. Your message will be passed on. Thank you for speaking to HinduPost. The stereotype which has been successfully created by MSM is that ABVP is a student body of uncouth, rustic types (or in Ram Guha’s words, “the kind of Indian who gets up before dawn, has a glass of cow’s milk, prays to the sun god..complaining, angry, or downright abusive…incapable of reasoned discussion or debate“) whereas the reality is that there are a lot of bright, articulate young minds who are increasingly getting drawn to ABVP due to the clear contrast it offers from the cliched, communist spiel of leftist organizations. In normal scheme of things, Diksha Verma would be lauded as a role model for all young girls due to the courage she showed in physically retaliating against her male attacker. But such is the poisonous public discourse created by our ‘secularist’ mainstream media that Diksha and her colleagues have been painted the villain of the piece. While our media hyperventilates & selectively outrages over certain incidents in college campuses (JNU protests, Vemula suicide, FTII protests), deadly violence against disadvantaged students in left-dominated campuses of Kerala go unheeded. If this does not prove agenda peddling and skewed vision of our MSM, what does? Diksha was not the only girl who was attacked by leftist goons in the whole Ramjas Fracas. Prerna Bhardwaj, ABVP Unit President of Kirori Mal College in DU, has also come forward to narrate a horrifying tale of how she was molested and attacked by leftist students. This post by her on Facebook throws more light on the reasons behind Ramjas students’ protest against the seminar being held on their campus. If a Gurmehar Kaur has the right to express her opinion without fear of abuse & violence, why don’t our Lutyens’ elites and self-declared intellectuals afford the same privilege to Diksha Verma and Prerna Bhardwaj?